It’s easy to feel like radio is a format on life support. On the FM dial, Clear Channel (ahem, excuse me, iHeartRadio) controls huge swaths of our broadcast landscape. Indie stations do exist—and are a Godsend on road trips—but they’re few and far between. Of course, there are tons of digital options, including tailored channels and online streamers where algorithms do the heavy lifting. But will the audience continue to grow or eventually fade out? 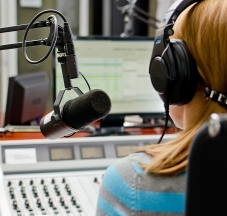 By keeping the legacy of college radio stations alive and strong, students on campuses from coast to coast experience the thrills of sharing and discovering media and creating stimulating programming. In doing so, they are lending their talents to a tradition that has been unfolding for generations and inspiring others to join in the work of shaping our future’s course. But don’t forget about those aforementioned algorithm-based services. Currently there are debates about how webcasting royalties should be calculated and whether private deals between labels and services should be considered in government rate-setting. Will the radio of the future be fully automated, human curated or simewhere in between? Does radio as a promotional tool make sense in a plays-based, on-demand universe? What role can radio—over-the-air or online—play in strengthening music communities and giving local artists a boost? How do radio programmers and station operators stay relevant in a sea of compting entertainment options? What are the barriers to access for everyday musicians, and how is digital helping to fill these gaps? As always, this panel is stacked with brilliant folks from the industry. Moderating is Larry Miller, director of NYU’s Music Business Program. He also hosts the Musinomics podcast (an FMC fave) and does consulting for a wide variety of music companies. Most importantly, his career began at a prominent New York radio station. Paneling are Nathan Hanks, Anya Grundman, Marika Partridge and Bianca Soler. Hanks has spent a lot of time at the intersection of music and technology, specifically in the marketing sector at ReachLocal and Music Audience Exchange. Marketing is arguably more important to radio than most other formats, but there’s an awful lot of noise to cut through these days. So how will radio survive? We have a feeling Nate will have some answers. Grundmann is NPR’s vice president of programming, so she ought to know a thing or two about where radio is headed. Grundman has overseen NPR’s acquisition of treasured programs like Car Talk and Radiolab, as well as their Sirius station and its Worldwide Services; she’s also helped to bring about new programming, AND serves as NPR Music’s executive director. NPR is one of the most listened-to stations (or collection of stations) ever, and they were savvy enough to get on the podcast scene before podcasts really caught on. They’re also one of the most trusted sources for new music, so we can’t wait to hear Grundmann’s insights. Speaking of NPR (which I usually am), former producer Partridge is in the process of founding DC’s first low-power FM station, WOWD-LP on 94.3 FM. Based in Takoma and officially sanctified by the FCC, the station is scheduled to be on air in July 2016. Because it’s independently-owned, the station aims to broadcast voices we aren’t used to hearing. Imagine hearing a high schooler narrate Ethiopian folktales or dole out gardening tips — sounds extraordinarily rad and refreshing, right? In addition to marking our calendars for WOWD’s launch, we’re psyched to hear Partridge speak on what it takes to organically grow a locally-oriented radio station. Finally, Soler is in charge of Broadcast Programming at Georgetown’s college station WGTB, and you can bet your biscuits they’re celebrating College Radio Day. But when the confetti settles, how is WGTB surviving and/or thriving? How do they reach new audiences? How is college radio doing in general? Soler will provide reports from the front lines. Radio is far from a horse-and-buggy technology, despite what you may have heard. In fact, its shown itself capable of both old-school resilience and whiz-bang innovation. What’s in store for different types of radio, according to its leading movers and shakers? There’s only one way to find out: register for FMC Summit 15!